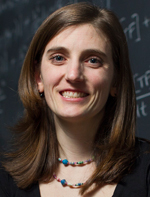 Home > Departments > Faculty > Jacqueline Dresch Ph.D.
Jackie Dresch received a B.A from SUNY Geneseo in 2006, and a Ph.D. in Mathematics and Quantitative Biology from Michigan State University in 2012. She has been at Clark since 2015. Professor Dresch’s research focuses on modeling transcriptional regulation in fruit flies (Drosophila melanogaster). She is interested in many topics at the interface of mathematics and biology, including reaction-diffusion equations, numerical solvers, sensitivity analysis, parameter estimation, image processing, and bioinformatics. Professor Dresch enjoys teaching a wide range of Mathematics courses, including Calculus, Linear Algebra, Differential Equations, Numerical Analysis, and Mathematical Biology. Pettie KP, Dresch JM, Drewell RA (2016) Spatial distribution of predicted transcription factor binding sites in Drosophila ChIP peaks. Mechanisms of Development. DOI: 10.1016/j.mod.2016.06.001.